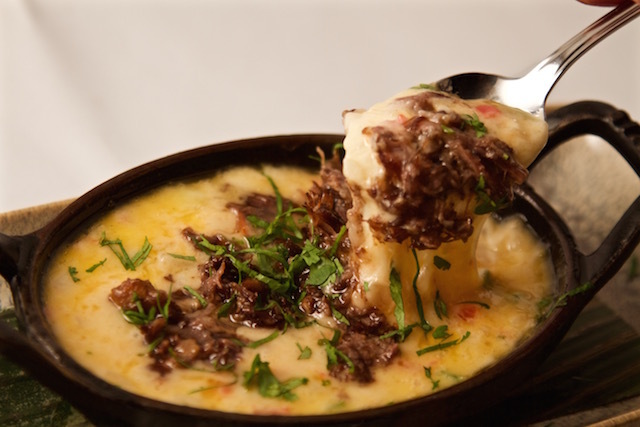 SHORT RIB QUESO FUNDIDO Otter Creek organic cheddar, braised Creekstone short rib, seared farmers' market salsa (tomato, serrano, garlic, knob onion). DUCK CARNITAS TAMAL Fresh-ground corn masa tamal, duck carnitas filling, green mole (pumpkinseeds, poblanos, tomatillos), peashoots. 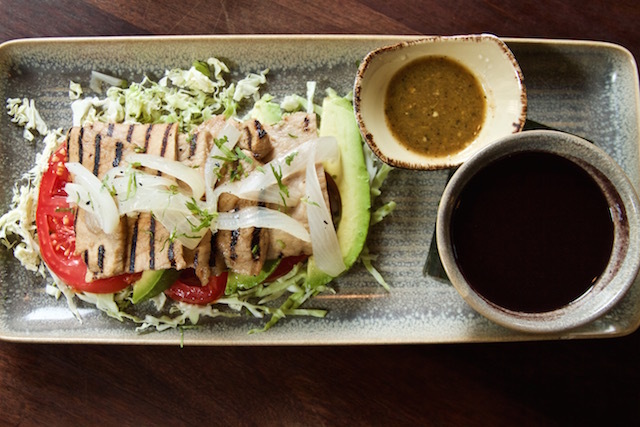 POC CHUC Grill-seared pork loin, local tomatoes, avocado, sour orange-marinated Savoy cabbage, coal-roasted white onions. Habanero-spiked black bean "soup." 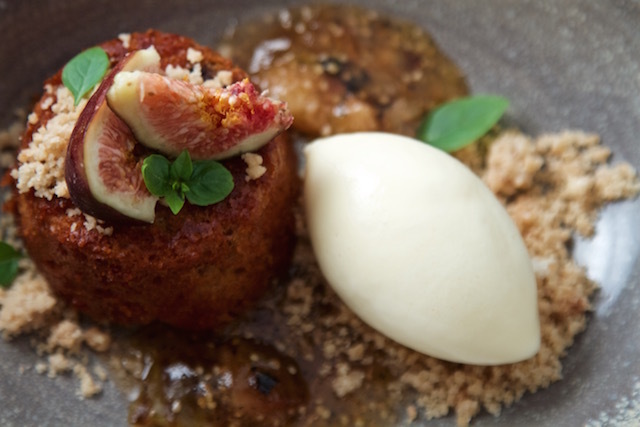 SPICED HONEY FIG CAKE Warm spice cake of fresh Seedling Farm figs & honey, sweet-savory roasted fig-tomatillo "salsa," goat cheese ice cream, canela crumble, micro basil. 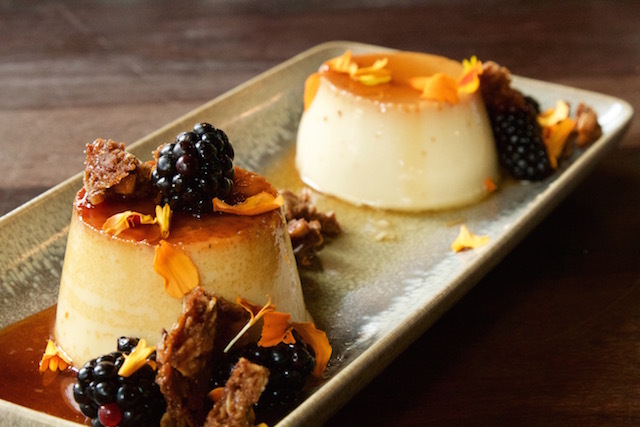 DÚO de FLANES Duo of Mexican caramel custards: classic Mexican vanilla and orange-lemon thyme flan. Local blackberries, oat-walnut clusters. PELLIZCADAS NEGRAS ￼￼￼￼￼￼￼￼￼￼￼￼￼￼￼￼￼￼￼￼Crispy huitlacoche-infused corn masa boats, carnitas-chicharrón-tomatillo braise, pickled cauliflower "couscous," añejo cheese. PESCADO in SQUASH BLOSSOM SAUCE Garlic-marinated feature fish, creamy squash blossom sauce (poblano chiles, fresh corn), grilled local summer squash, dry Jack chicharrón. DUCK IN MOLE de MANZANO Wood-grilled duck breast, savory mole de manzano (manzano chiles, sesame, tomatoes, plantains, white chocolate), chayote-potato mash, charred local calabacitas, pickled manzano chiles. 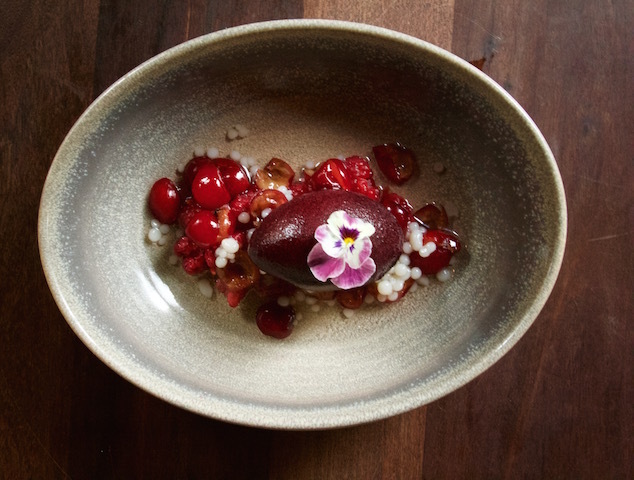 SOPA de FRUTAS Klug Farm blueberry-lemon sorbet, local fresh raspberries & tart cherries, lychee "pearls," lemon verbena (from our rooftop!) sparkling broth. 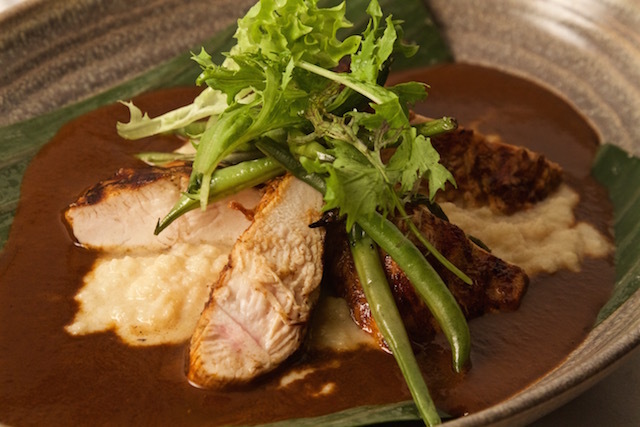 CHICKEN IN MOLE LANDERO Red chile-grilled Gunthorp chicken breast, Chef Jim's family mole (mulato chile, peanuts, almonds and 12 other ingredients), creamy cauliflower mash, grilled green beans, Bayless Garden greens. 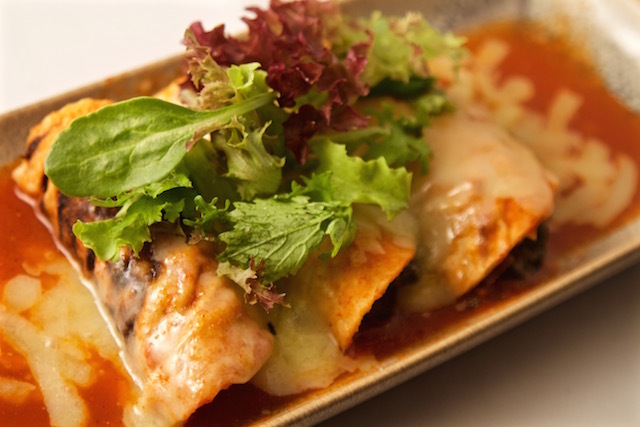 WILD GREEN & HAM HOCK ENCHILADAS Just-made heirloom corn tortillas braised wild greens (quelites) & ham hocks, roasted tomato-morita sauce, melted artisan Jack cheese. 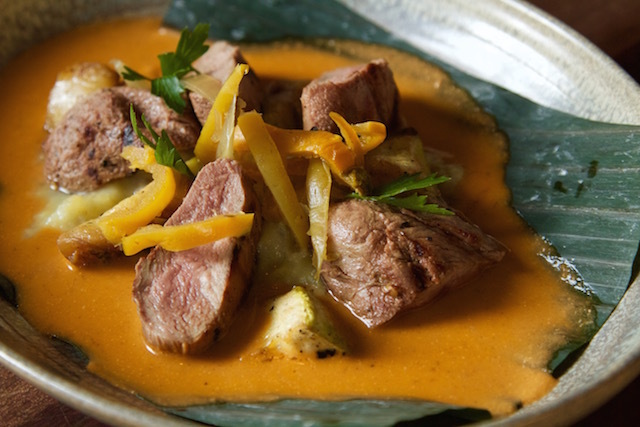 The dishes on Frontera’s latest seasonal summer menu have migrated from The Library (our private dining room) into the main dining room, but you might say they really originated in Veracruz. 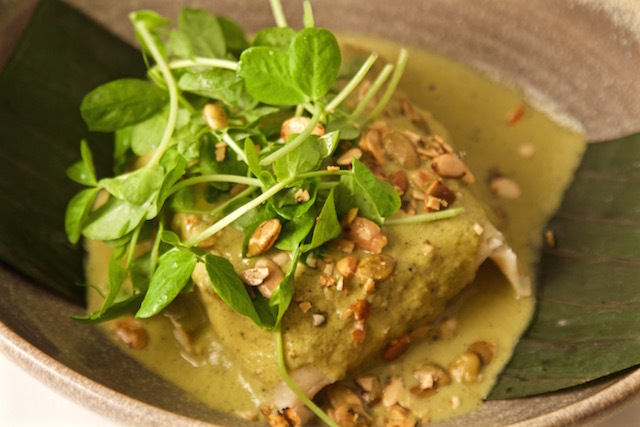 “A lot of these dishes are inspired by my family in Veracruz…this menu is a chance to showcase these dishes to a wider audience,” said Jim Ortiz, Frontera’s sous chef. A great example? 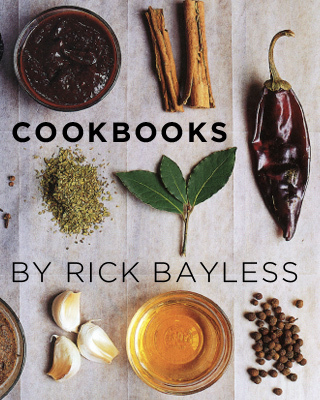 The recipe for Mole Landero— a symphony with mulato chile, peanuts, almonds and 12 other ingredients— which comes directly from Jim’s aunt. The Pellizcadas Negras, meanwhile, are something that Jim’s mom would make at home. (Lucky him!) 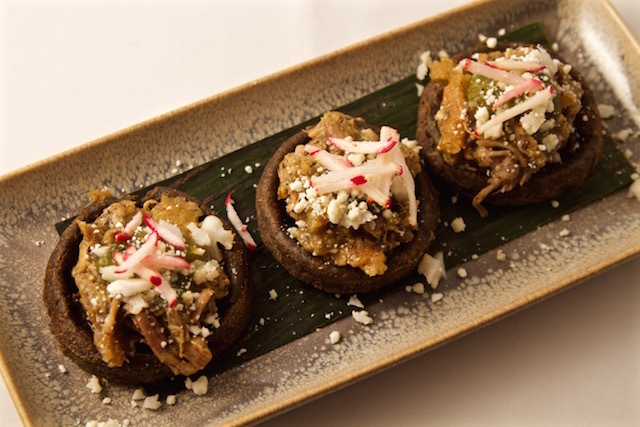 These pellizcadas are incredible little masa corn boats filled with a rich, tangy braise of carnitas, chicharrón and tomatillos. Speaking of corn, this menu also celebrates the return of Midwest corn season with our popular grill-roasted ears of Nichols Farm corn two ways: Slathered in homemade sour cream, añejo cheese & chile or dressed with serrano mayo, cilantro and fresh cheese. 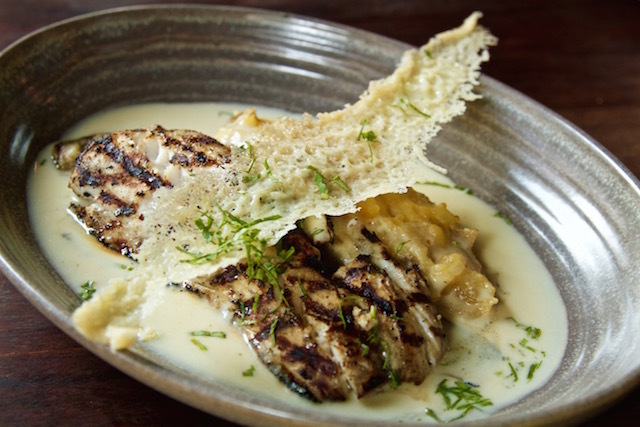 Taken together, this menu is one of our seasonal best.